Smart Switches or Smart Plugs, as they are sometimes called, are one of the oldest smart home devices. They let you switch anything plugged into them on and off, controlled by iOS and Android apps. This review will focus on the first Apple HomeKit Certified smart plug to hit the market - the $39.95 iHome ISP5 SmartPlug. Like the previously-reviewed Belkin WeMo Insight Switch and D-Link DSP-W215 mydlink Wi-Fi Smart Plug, the ISP5 SmartPlug uses Wi-Fi and doesn't require a dedicated hub in order to work. 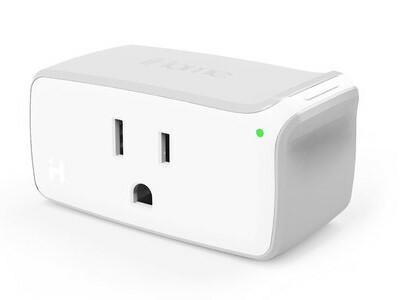 Unlike other smart plugs on the market, the iHome ISP5 has a horizontal format, which means it won't block the second outlet in a standard U.S. duplex socket. The ISP5 is a simple device. It has a single multi-color LED to indicate Wi-Fi status, power indicator in the shape of the iHome logo and a button that doubles as an on/off switch and device reset (when held down for 12 or more seconds). It measures 2.8" X 1.4" X 1.4" (not counting the prongs on the plug). To set up the product, you'll need to download the iHome Control app from the Apple App store. Be sure to select iPhone app - there's not an iPad app. As with virtually every other HA product I've tested, you have to set up an account with the manufacturer. The Belkin and D-Link plugs use WPS (Wi-Fi Protected Setup) to provide an easy setup experience. The ISP5 doesn't support WPS, instead initially creating its own network that the iHome app searches for and connects to. The plug also is limited to connecting to 2.4 GHz networks only. Setup didn't go smoothly. After creating an iHome account, the application recommended I reset the device to factory defaults. I pressed the button and held it for the recommended 12 seconds and the LED alternatively flashed red and green. The discovery of the device and connection went smoothly. However, as I neared the end of the setup, I got a error message "Object not associated with any home (12)". I assumed the error may have occurred because I previously set up a HomeKit network named Home. Although the network was no longer active, its information must have been stored - maybe on iCloud. An alternate possibility was the firmware was out of date. Late in the setup process, I was prompted to update the firmware. So I updated the firmware, then deleted the iHome Control app from my iPad. I then reset the ISP5 to factory defaults and re-installed the app. Although the app had indicated all app data was being deleted along with the app, there was still some data found from the first install. I didn't have to re-register for an iHome account, the setup program "knew" about the SmartPlug and knew it had been reset. I then re-discovered the device and the setup completed without the error message. Interestingly, when I went to assign the ISP5 a room name, the choices included Living Room, Office and Kitchen, which were room names I used when testing the Insteon HomeKit enabled Hub. The setup program must have also used stored network credentials, as I was never prompted by the setup program for the Wi-Fi WPA/WPA2 PSK for my default network (Strohmeyer). The gallery below shows screenshots for setting up the device.